Anyone shooting a .32-20 WCF in a rifle? I am looking at a Browning 53 that I have no absolute need for but it is pretty and intrigued me. What loads are you shooting? I will probably be going with cast if I get it. Anyone use one for deer? Might try for a Turkey or Coyote with it. A friend of mine down in Florida hunts with a Winchester 32-20. Nice rifle you picked up! It is similar ballistics to the 30 carbine. Fun to plink with it, but not much else I would do with one. Gonna be a creampuff on your shoulder. I don't know where you are from but you probably wouldn't want to get caught with a center fire rifle during Turkey season in Georgia. That's a beautiful rifle! I have an old S&W revolver chambered in 32 WCF (32-20) good little plinker. Might be a tad light for deer, although I'd imagine more than a few have been taken with it back in the day. 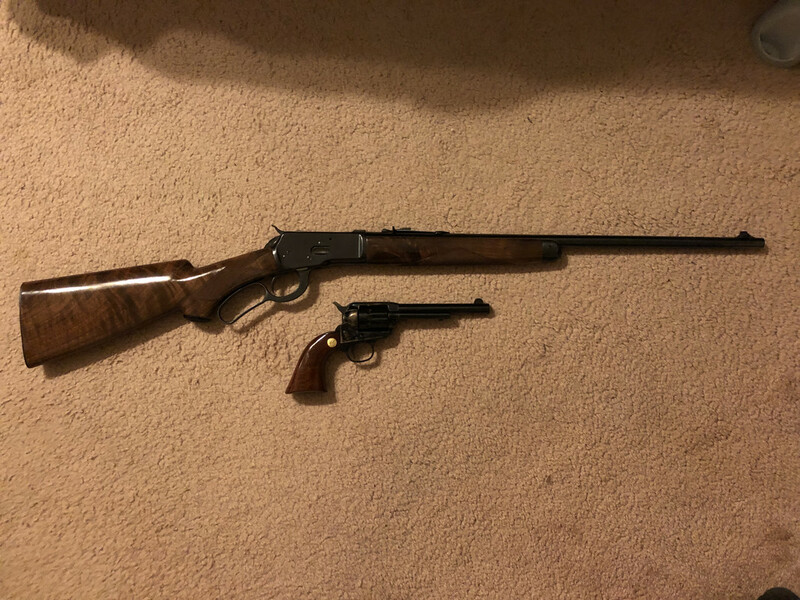 Went a little nuts with the .32-20 WCF and won an auction for a Cimarron Model P Jr with a 5 1/2” barrel in that caliber. Guess I need to invest in a mold now. Turkey and coyotes would be perfect.